The Eagle Claw Dagger Display Set follows an ancient motif that exists in both Native American and Mexican folklore. The bald eagle, a symbol of strength and majesty, battles the venomous rattlesnake, a herald of death and punishment. This set includes a stainless steel blade with decorative sheath and a decorative display stand. Sculpted from polyresin, the dagger stand depicts the aforementioned scene with high detail. With wings outstretched, the bald eagle overtakes the coiled snake as it strikes with its fangs. A skeletal claw with talons emerges from the base. The dagger with sheath fits into its grasp. 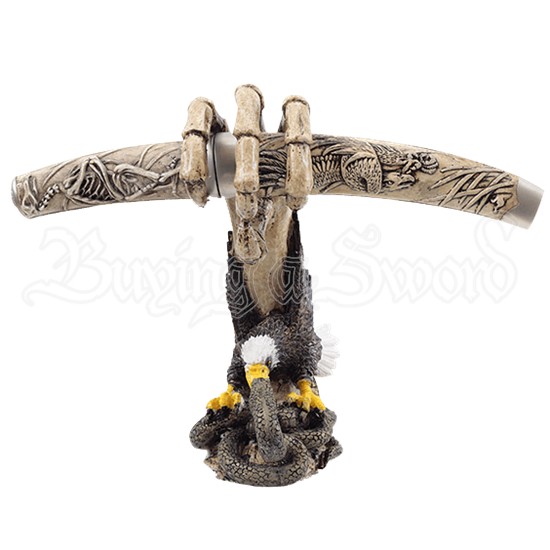 The sheath continues the southwestern theme with engravings of an eagle skeleton, snake, and foliage. Metal accents add a touch of contrast. The tanto point blade of the dagger is crafted from stainless steel.